EssayShark.com is one of those essay writing services I have mixed feelings with. While they promise to deliver high-quality paper in the shortest time frame, feedback from customers generally vary and depend on the writer being assigned to you. In this EssayShark review, you'll find a great example on how essay companies mislead students. Is EssayShark legit? I know for sure. 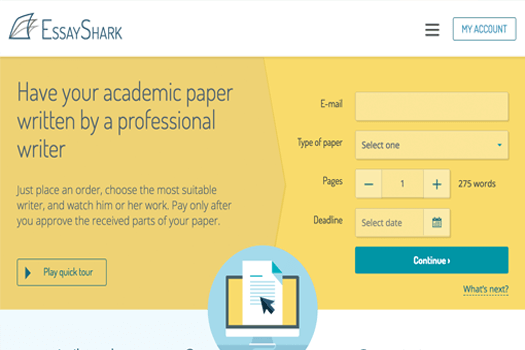 Owned by ONE Freelance Limited, the website EssayShark.com has the exact same layout as Bid4Papers.com. There's the "Why choose us?" section, the stats, comments left by customers, and their list of features. They claim exclusive features such as previewing your order for free, live chat with your writer and so on. These features are often found on the majority of essay writing services. 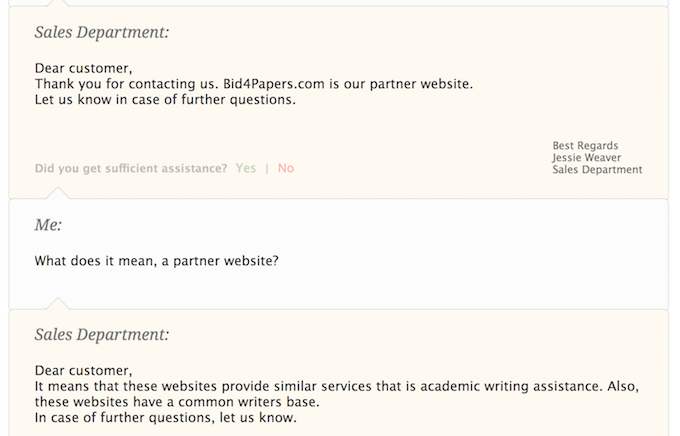 Since there aren't many differences with Bid4papers, it's hard for me to even write about their website. It's just like Bid4Papers. That's about it. In my opinion, the companies that own different sites under the same brand that offer the exact same service and prices shouldn't be trusted. It lacks professionalism. Not all essay writing service companies are willing to admit they're running multiple websites, much more have a similar pool of writers for all their websites. But I have to give credit to EssayShark for confirming this when I got in touch with them. They have a bidding system. It's simple to use and gives the client freedom of choice. It's worth noting that prices are two times higher than the average in the market. As my research of the best bidding services has shown, 5 page essay with 2 days deadline will cost you at least $120. I couldn't find any discounts on the website. This time the quality was good as the writer was a real expert on the subject. Still, I think they should hire more qualified people. Choosing writers is often a hit-or-miss, but I found that working with ENL writers is almost always a better option. According to SimilarWeb, a large percentage of EssayShark's writers comes from Kenya, with a significant percentage also coming from the Philippines and Ukraine. There are plenty of good ESL writers from these countries but of course, they're not the places to find native English-speaking writers. It's worth noting that their competitors, EssayPro and StudyBay, have similar writer demographics as EssayShark's, although they offer their services at much lower prices and better quality. The payment page is exactly the same as the brother-website, no differences here. You fill in, select a writer, pay, receive your paper. This is a critical part for me and what I found annoying is that EssayShark doesn't have a Live Chat feature, which is supposedly a standard in any type of online service these days. I had to submit my support query via tickets stystem just to inquire about their prices and even this took them a while to send me a response. They also didn't provide a phone number, so there's no way to contact them in case of emergency. The money back policy of EssayShark is absolutely identical to the policy of Bid4Papers. It's not just the means by which you'll get your money back, the exact same words were used to define it. Be it as it may, it's only normal, given that both of these websites are owned by the same people. Putting it short, you won't need to pay before the paper is done, or at least before some of it is finished. The difference between what you paid and what you bid remains – that's the lowest bar which depicts how much money you can get back in case the writer finished a portion of your paper. You cannot, however, get a complete refund of the money you've paid for a specific paper. Bids. Again, the bidding system is what I like the most. Works wonders and makes for a better experience. Unlimited Revisions. I can ask the writer to revise my paper as many times as I want, and I can pay in parts until I'm completely satisfied with the final output. Marketing strategy. The website which is identical to its twin didn't surprise me at all, the feeling of deja-vu was consistent and not pleasant. No Instant Support. The absence of a Live Chat feature and phone support makes it difficult for me to contact them in case I have concerns that need urgent response. I can recommend EssayShark.com (and Bid4Papers). Really. Just choose the highest bid. Concurrently, you must be mindful it's a copied website that's just a piece of a bigger picture. There's no reason for me to use EssayShark, since there are many top sites that deliver great quality (including another bidding site EssayPro), so why to risk? And like what I mentioned above, they share the same roster of writers as that of partner websites, EssayPro and StudyBay. These writers are generally OK, but a side-by-side pricing comparison made me realize EssayShark has the worst pricing policy among these websites. Guys, share your EssayShark reviews here (comment anonymously).